Plants growing on land require a certain amount of salt to stay healthy. But too much of a good thing is a bad thing. Salt concentrations beyond a plant’s tolerance level will damage or even kill the plant. Some plants, such as tomatoes and onions, are intolerant of salt. At the other extreme are salt-tolerant plants such as mangrove trees that live in salt marshes, beaches and tidal environments. One way saltwater damages plants is through osmotic forces. Water naturally moves from areas with low salt concentration to areas with high salt concentration. This process is called osmosis. In normal growth, plant root cells with relatively high salt concentrations draw water from the surrounding soil that has a low salt concentration. But when the salt concentration of the soil is higher than the concentration in plant root cells, the soil draws water from the plant. As a result, the plant dehydrates, wilts and dies. Salt water damages plants not only through osmotic forces but also through toxic levels of sodium and chloride. When salt dissolves in water, it breaks down into free sodium and chloride ions that plants absorb. Up to a point, sodium and chloride are good for plant health and help process vital enzymes. But salt levels exceeding that healthy point will poison the plants. Many varieties of fruit trees and woody ornamental bushes are particularly sensitive to salt poisoning. Plants suffering from excess salinity show certain common signs. Mild excess salinity shows up in leaves that are much darker and smaller than normal. It also shows up in reduced water intake that stunts normal plant growth. As salt levels increase, leaves of some plant species may turn yellow, droop and fall off. On other species, leaves turn brown around the edges like they were sun scalded. The salt-poisoned leaves die from the outer edges inward to the stem, then fall off. Salinity management is particularly important in dry regions that rely on irrigation. 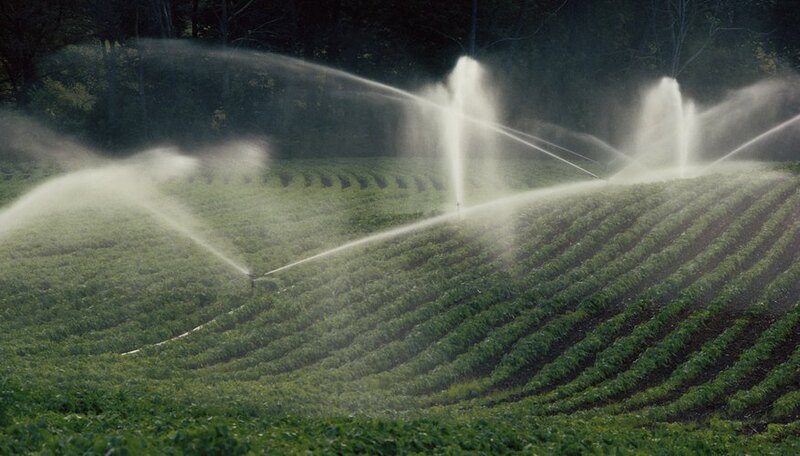 Many irrigation operations recycle irrigation water. Over time, as water is recycled again and again, salt levels in the water build up and salt is deposited in the soil, which reduces the soil’s ability to absorb water and air. As salt levels in irrigated land increase, a white or black crust can form at the surface of the soil. Plants start to suffer damage when soil sodium concentration exceeds 230 milligrams per liter, and chloride concentrations in soil exceed 350 milligrams per liter. Periodic deep irrigation with fresh irrigation water helps remove salt from soil. Salinity Management.org: What’s In the Water? Does Soft Water Kill Plants & Grass?